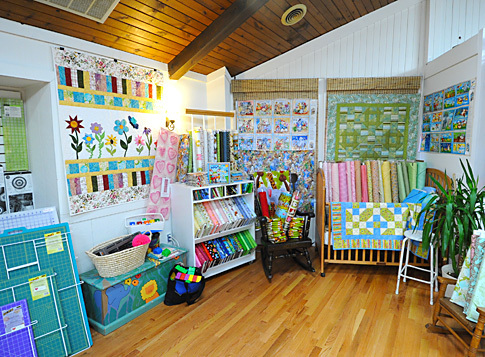 HeartSong Quilts is a family-run quilt shop with unique original fabric and pattern designs. Enter a world of color and light. 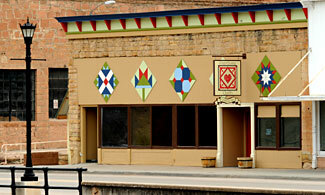 When you step into HeartSong Quilts, located in a historic 1902 sandstone building in downtown Hot Springs, South Dakota, your senses are delighted by luscious sights, sounds, and smells and treated to complimentary chocolate. 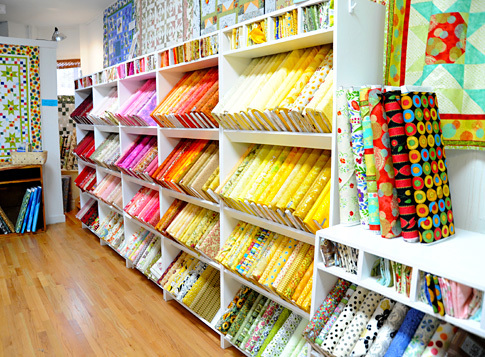 Bright, airy, and filled with the latest designs, colors and trends, you are invited to browse our lines of quilt fabric, thread, books, patterns, batting, quilt kits, and other sewing supplies. 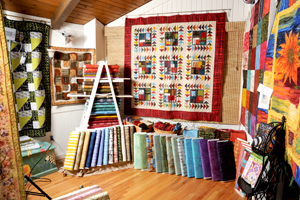 HeartSong Quilts was founded by Ann and Brian Powers in 2008 out of a passion to minister to the quilting and crafting communities of the Black Hills, South Dakota. It was our desire to serve the people in the community by providing a place where people could gather to socialize, share ideas, and encourage each other in their creative projects. We also wanted to serve the community by offering eclectic and fun fabrics as well as supplies, notions, patterns and other sewing needs. 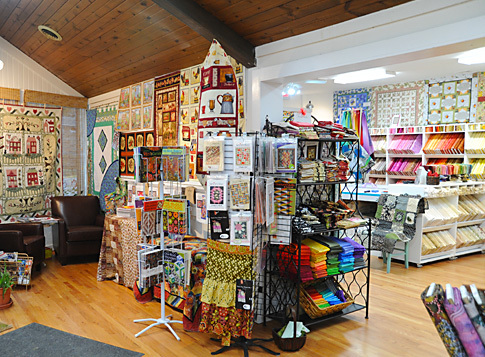 HeartSong Quilts is a creative textile retailer offering a wide range of fabrics, threads, patterns, notions, and books for the quilting enthusiast. 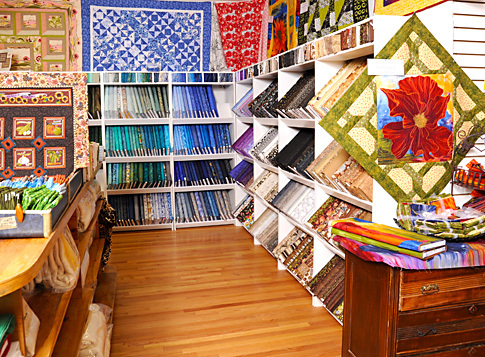 We have inspiring bolts of fabric in 2000 square feet of enchanting retail space. We specialize in the different and unique—like over 120 Australian aboriginal fabrics. 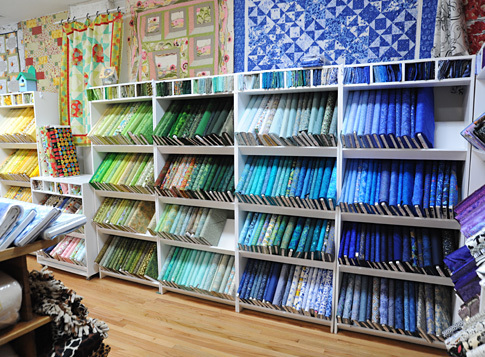 Most importantly, we are a fun and loving gathering place for quilters of all kinds. We bought a historic sandstone building in downtown Hot Springs and renovated it to accommodate the retail shop and a classroom. Ann’s creativity, vision, and knack for fun make every visit an entertainment experience. Ann has a B.A. in Interior Design, and an innate sense of style and fashion. She’s never met a pattern she’ll follow, and she continually innovates and tries new techniques on all her projects. 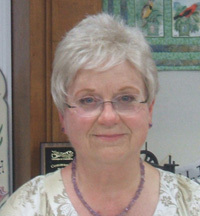 Julie Standen joined us in the shop in 2010, and has been a blessing to us and our customers. 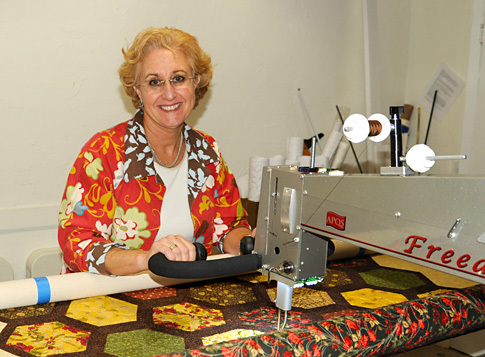 A recovering nurse, Julie has been quilting since the mid-80s, and is a phenomenal quilter. 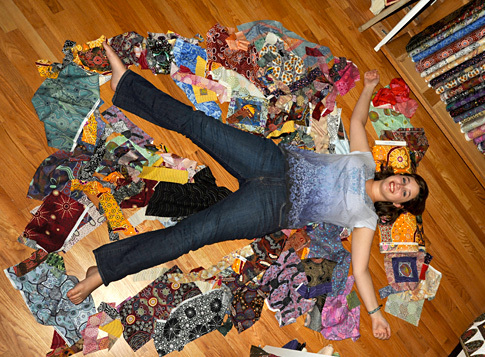 Give her some fabric, turn around a couple of times, and voila, she’s got a quilt! She comes at quilting from a different angle than Ann. Julie is a more traditional “old fashioned” (her term) quilter. 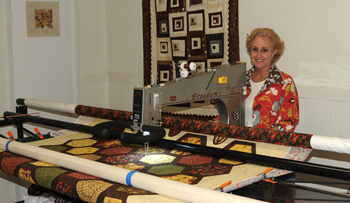 Ann does longarm quilting on our APQS with Intelliquiter. Her work is fantastic! 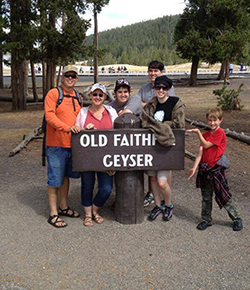 Ann and Brian moved to Hot Springs from South Florida in 2008. They have four children–Christine, Sam, Tom and Jesse. Christine is currently finishing her third year of college with a double major in Musical Theater and Music. Sam works in the shop and will be starting at the School of Mines in the Fall, Tom, a luthier, makes and repairs guitars and operates a music store in town. Jesse is being homeschooled and works at the family ice cream shop. Tucker and Scylla (small auxiliary dog and large primary dog) lie around a lot, but add a lot of love to the family. Nora the cat, a black and white tuxedo, is the shop greeter. We are open Monday through Saturday, 10 am to 4 pm. We are closed the week between Christmas and New Years. Winter hours: Monday through Saturday, 10 am to 4 pm; Starting Dec 11. 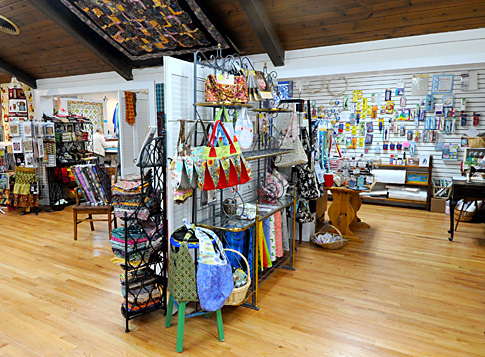 HeartSong Quilts’ mission is to serve the Lord Jesus Christ by providing for the creative needs of quilters everywhere by exceptional products, service, and quality, and to build a true relationship with our customers based on trust and love. Today, I received your shipment and as always everything is in perfect order. Thank you so much for your thoughtfulness, in mailing my fabric in a smaller envelope and refunding me the difference. I very much appreciate your effort and your good customer service. It has been a pleasure doing business with you and I have been recommending you in our quilt group. I wanted to thank you and your staff for being so kind and helpful when I called to place an order for your beautiful Australian Aborigine fabrics. They arrived quickly and are just as beautiful and unique as I was hoping. I look forward to ordering from you again in the future.